In May 1947, Harvard’s Department of Music assembled a host of composers, scholars, writers and performers for a three-day symposium on Music and Criticism. Eight hundred attendees listened to opening remarks from E.M. Forster, who began, “Music is the deepest of the arts and deep beneath the arts.” They also heard talks by Roger Sessions, Virgil Thomson and Paul Henry Lang. Olga Samaroff reflected on her career as a pianist, newspaper writer and television broadcaster, touching on themes of music literacy for laypeople, the ethics of music criticism and the future of music in America. Several compositions were commissioned for the event and thus received their world premières in Cambridge. Bohuslav Martinů was commissioned to write his sixth string quartet for the symposium, correspondence surrounding which commission features prominently in the introduction to the critical edition of Martinů’s string quartets which was published last year by Bärenreiter Praha. Harvard professor Walter Piston’s “Done. W.P.” in blue pencil is scattered throughout the collection, as he ticks off to-do list items. Piston also contributed a new string quartet. The Collegiate Chorale, a vocal ensemble notable for being racially integrated from its inception in 1941, sang a commissioned work by Paul Hindemith, Apparebit Repentina Dies, and pieces by Gian Francesco Malipiero and Aaron Copland. And the Martha Graham Dance Company performed William Schuman’s Night Journey for the first time, and (not a première) Carlos Chávez’s Dark Meadow. 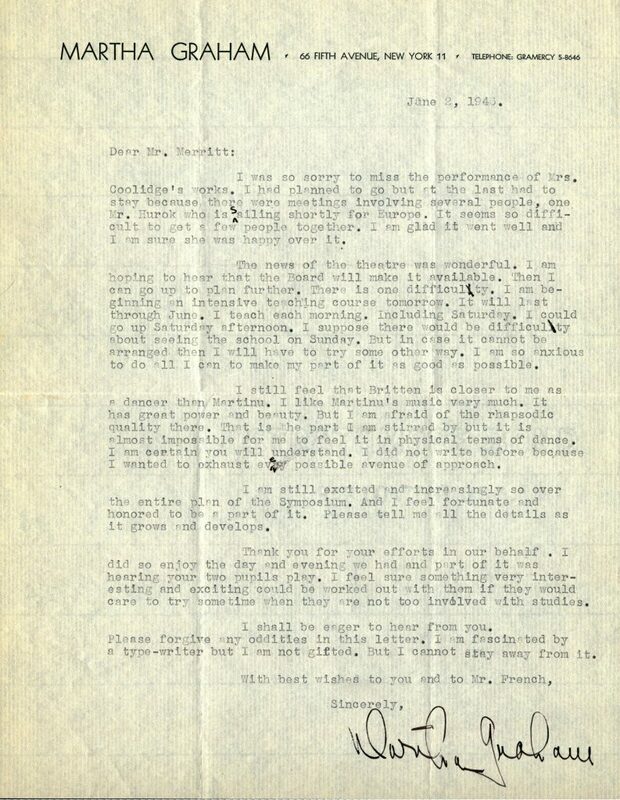 In this letter, sent after the symposium to Harvard professor A. Tillman Merritt, Graham reflects poetically on the experience. Flying in E.M. Forster doesn’t happen without a considerable amount of paperwork. The documents tracking the planning and execution of the symposium are now held at the Isham Memorial Library, 41 folders in all. There is correspondence with the participants in the symposium, the commissioned composers, performers, donors, piano-tuners and chair-loaners. There are press releases, journal and newspaper reviews, and schedules. There are many, many receipts. 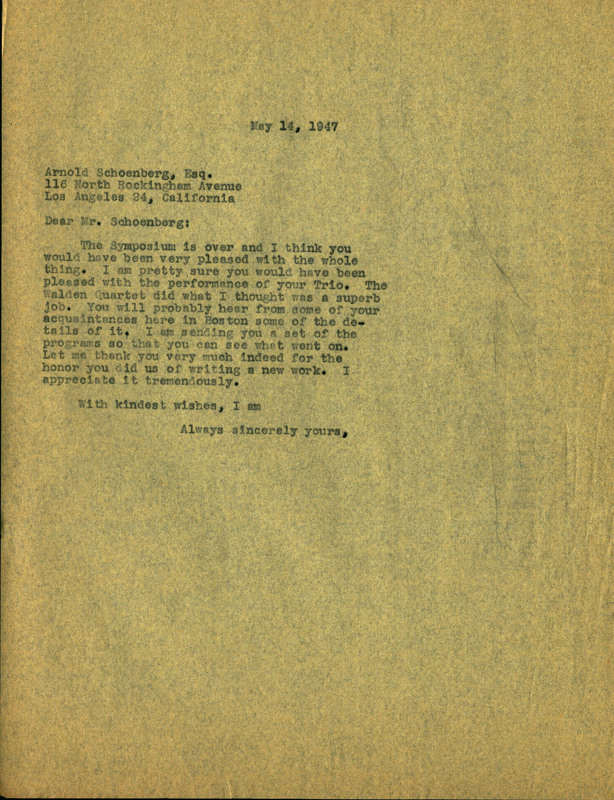 The conference papers were published in 1948 as Music and Criticism: A Symposium. An attendee’s account of the event as well as some institutional context are to be found in Elliot Forbes’s A History of Music at Harvard to 1972 (Department of Music, Harvard University: 1988), pages 103-110. But these papers tell us of the mechanics, of the logistics, and of the personalities. For instance, it seems Martha Graham and her company were happy enough to be boarded at local homes. Sadly, the names of their hosts do not appear to have been retained. This collection of correspondence, clippings and ephemera, assembled under the title Records of the Symposium on Music Criticism, held May 1-3, 1947 at Harvard, is available for use on site in the Isham Memorial Library whenever that section of the Music Library is open, generally Monday to Friday, nine to five. Click on the title above, then View Onsite, to set up an appointment to come and see these materials in person. If you are, as E.M. Forster described his usual whereabouts, “in the other Cambridge” or otherwise unable to come visit in person, Isham staff will be pleased to work with you to provide digital surrogates. Click on the collection title, then View Onsite, and then Switch to Photoduplication. 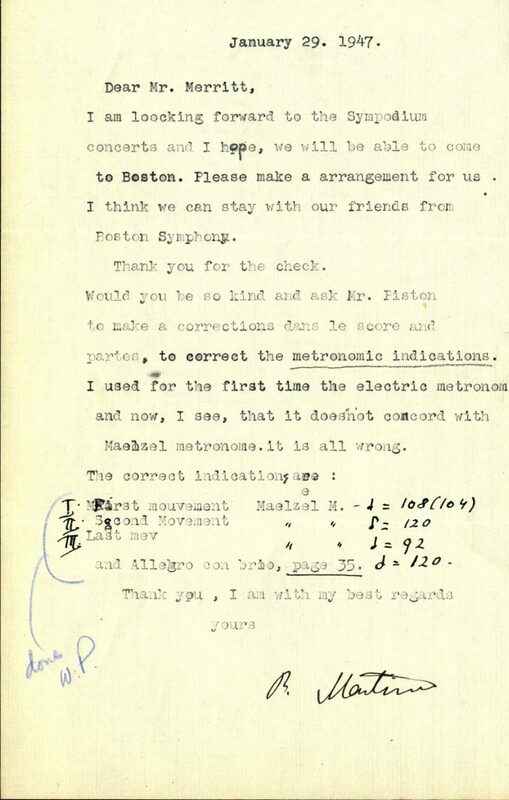 A last letter: this one from an organizer to Arnold Schoenberg, who also contributed a new work, his String Trio Op. 45, the first work he completed after his near-fatal heart attack of 1946.